Note: I originally wrote this post in April, didn’t publish it for a bit, and then we had all of that awful stuff in Manchester, so it just didn’t seem right publishing it at the time.Imagine you’re reading this in April. I’ve been in Manchester so much recently that I’m expecting to get a bill for Council tax. Well, OK, it was only twice in two weeks, but you know what I mean. Second time around, it was to see “Extreme Robots”. I’ve been a fan of Robot Wars since it kicked off on the telly about 20 years ago. I’ve always wondered what it was like to see it up close and personal. Despite the show being revived, I’m guessing that getting tickets for the actual recording of the program is a nigh-on impossible task, seeing as filming only takes place over 4 days. When “The person who must not be named’ noticed that a similar “touring” version had started up, I grabbed the tickets as fast as humanly possible (or I might have waited until pay day, I can’t remember). The days ticked by, and before we knew it, 22nd April was on us, and it was time to head to Manchester. The weather gods had smiled upon us, and the journey was uneventful. There was, of course, a stop for a Maccy D’s somewhere down the road, in the strangest looking service station I think I’ve been in. It looked more like an office block than an actual service station. Food was consumed, and we headed off in the general direction of the Trafford Centre. We knew that the arena was going to be around there somewhere, so it made sense to actually just go there instead of venturing into the city centre, and its hilarious traffic system. I’ve been to the Trafford Centre a good few times now, and rarely ever buy anything. I must have been there 5 times, and I’ve bought a Pendulum CD and a coat. On an entirely different side note, I’m listening to music on my phone. I was halfway through typing “Pendulum” when my phone chose the song I actually bought the CD for… “9,000 Miles”, off the CD “In Silico”. There was a 1 in 12,463 chance of that happening. Weird. Er, anyway. The Trafford Centre. It rally is one of the more “picturesque” shopping centres I’ve been to, with foliage and fountains everywhere. Unfortunately, this is shown in the cost of everything in the shops, hence why I don’t buy much. Time was approaching to go and find this arena where Extreme Robots was on. Turned out it was about a quarter of a mile away, but due to “The Other Person’s” inability to negotiate roundabouts, we ended up going on a two-mile loop of the place. Eventually we got there. I think it was about 45 minutes before the show started, but already there were queues. I’d paid the extra and got the VIP tickets, which meant we got a shiny VIP pass, express entry, decent seating, and a tour of the pits at the end. The first thing you’ll notice, is that, compared to the Robot Wars arena, this one is TINY. The guy who sat in front of us had actually been to see Robot Wars being filmed (lucky sod), and said the arena was about a third of the size. 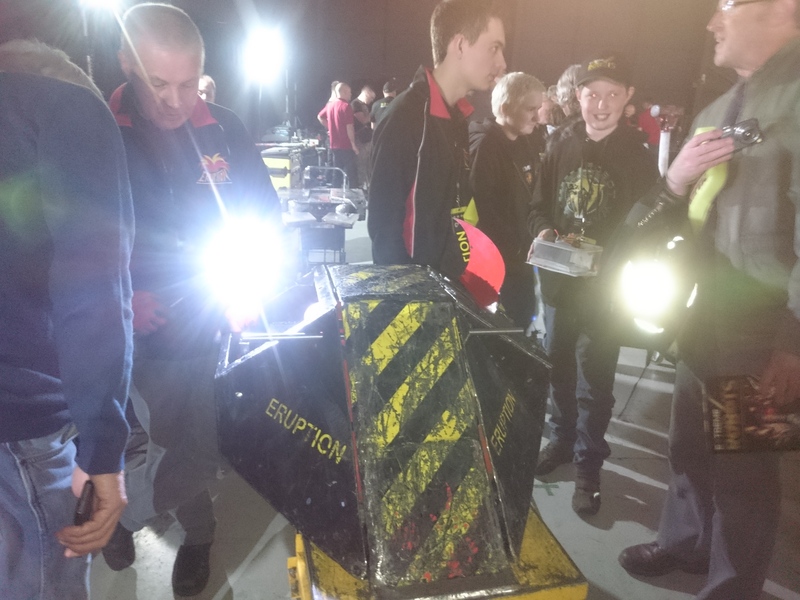 Still, all of the Robot Wars hazards were there… the pit, the floor fipper and flames. Except the flipper and flames never actually worked, much to the audience’s amusement when the presenter guy tried to show them off. 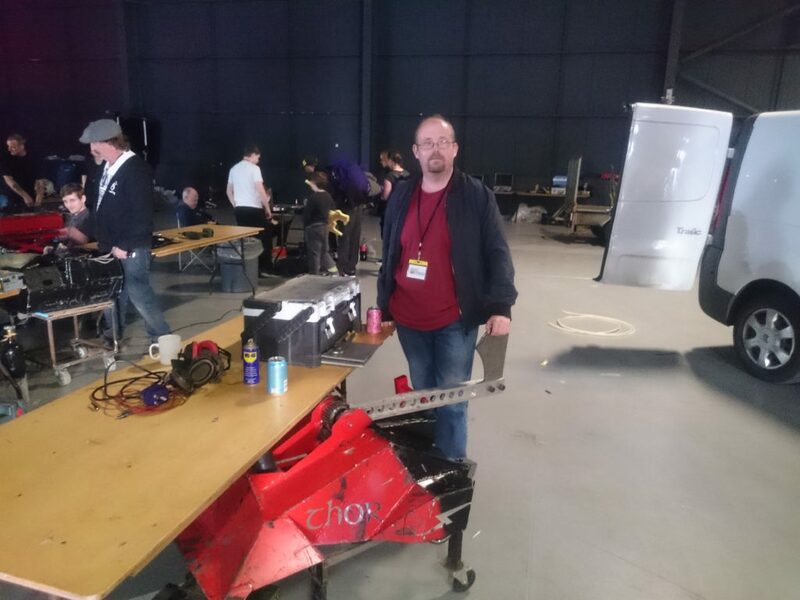 Despite the size of the arena, there were still some of the old Robot Wars favourites turned up. TR3, and Eruption, who made it to the RW Grand Final this year amongst the famous names. In between the main bouts, there were contests for smaller robots too – about 10 of them in the arena at the same time – basically just a melee. Or however it’s spelt. I don’t think anyone could actually follow what was happening. And so, the main bouts. Not going to say who won, just in case it’s the same for every show (which I doubt), but there was one “amusing” robot, named “Donald Thump”. Unfortunately, this robot, despite is hilarious name, didn’t actually work. Maybe that was the joke, but I think there were three bouts where it didn’t even begin to get going. Of course, there was then the pit tour. And that was great. 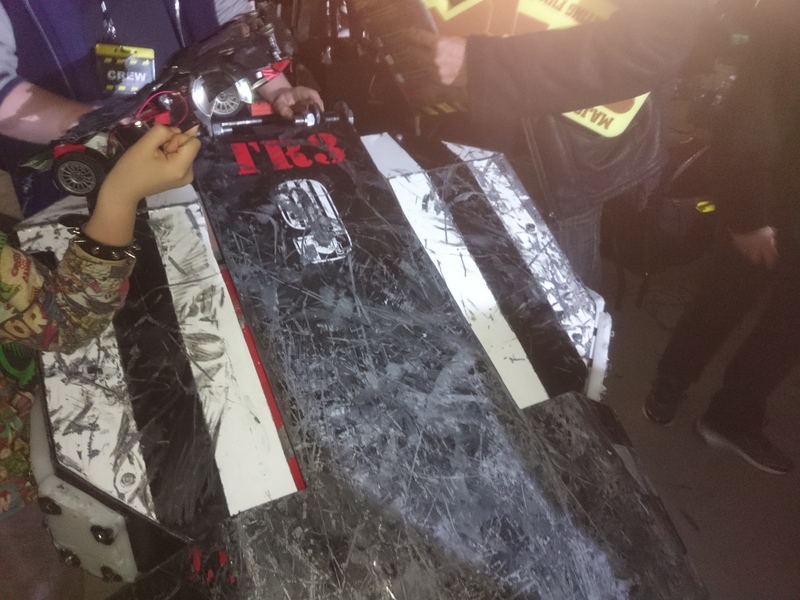 I was able to get up close and personal to some of the very robots I’d been watching on Robot Wars only a week or two earlier. Included in the VIP ticket was a trip around the pits after the show finished, where you get to see the robots (and the operators) up close and personal. Overall, a very enjoyable few hours. It’s left me wanting to see the real Robot Wars being recorded though. Now *that* would be epic. Posted on July 14, 2017 Categories Days OutTags destruction, electronics, extreme robots, machines, manchester, showrLeave a comment on Extreme Robots!